You are here: Home / Featured / US Imperialism Strikes Venezuela, Whose Next? A peaceful street protest demonstration in Venezuela last week escalated into an attempted presidential coup. Mr. Juan Guaid, an opposition party neophyte, proclaimed his dictatorial take-over of the government and was immediately recognized by the Trump administration and their allies in Latin America. And denounced by many other countries including China and Russia. Several demonstrations in support of the Venezuelan people and President Maduro took place in New York City throughout the weekend. On Thursday night several hundred people rallied in front of the Venezuelan Consulate in midtown and marched through the streets to Trump Tower. On Saturday afternoon rallies were held in front of the Cuban Mission and at Union Square Park. Many progressive organizations were represented and spoke in solidarity against US imperialist intervention in the affairs of sovereign nations. “We also want you to understand that we’re an African people. We understand our role in the unity and the struggle against imperialism. We understand the fundamental contradiction. But we also understand the right to self-determination and national liberation. In that regard we say, Trump and Bolton’s plan is not just in the western hemisphere, it has also targeted Zimbabwe. The first revolutionary act is to liberate your country. The second is to take back the resources of your country, not only above ground, but under the ground. We’ve got to be on the right side of history. We are proud to be here with you all. Because this is where we should be. It is not just an intellectual question; It is a question of action. US hands off Zimbabwe! US hands off Venezuela!” Clay concluded. 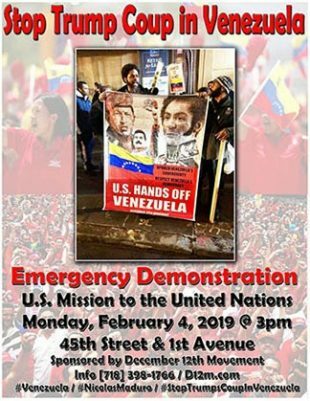 The December 12th Movement has called for a City-Wide Rally against the attempted coup on Monday, February 4, 2019 at 3PM, at the United States Permanent Mission to the United Nations located on the corner of 45th Street and First Avenue, NYC. For more information call (718)398-1766.